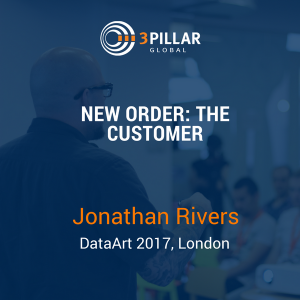 Jonathan Rivers, the CTO of 3Pillar Global, recently spoke at a DataArt event in London. Jonathan’s talk, titled “New Order: The Customer,” focused on how to ensure that your teams are building for your customer. This DataArt event was a one-day event held at Lloyds of London. Jonathan’s presentation centered around the idea that your teams need to focus not on the technology they’re implementing, but on the customers using it. He emphasizes mapping your customer journey so that your teams are consistently centering their product development around them. In this way, your product and your business will succeed. Jonathan’s full talk is available on 3Pillar’s YouTube channel and is embedded below. Jonathan Rivers is the Chief Technology Officer at 3Pillar Global. In this role, he leads 3Pillar’s Product and Engineering organizations. This includes more than 800 software engineers, product consultants, product managers, quality assurance, and user experience professionals. He has 20+ years in System Administration, Data Center Operations, Cloud Infrastructure, Orchestration, and Automation. Before joining 3Pillar, Rivers was the Interim CTO at The Telegraph of London, where he served as Director of Service Delivery and Operations before becoming Interim CTO. He was part of the leadership team that transformed PBS into a digital leader as their Sr. Director of Web Operations and Customer Support. The DataArt-sponsored event took place on October 18 and was titled “Unleashing Human Potential as the Critical Success Factor for AI and Digital Transformation in Financial Services.” The day’s focus was on how both digitalization and artificial intelligence impact the financial services space. In addition to Jonathan’s presentation, the day saw presentations from David Alstadter, Head of Digital Platforms at HSBC, and Rohit Talwar, a renowned and entertaining business futurist. For more information on the event, you can read the press release about the event DataArt published on their website. If you like Jonathan’s take on New Order: The Customer, please help us spread the word.